The Pelvic Clock (also used in the Feldenkrais method) is a perfect beginning exercise since it illustrates how to initiate movement from the core, but can also be enjoyed by advanced students who continue to garner self-awareness from its repeated practice. 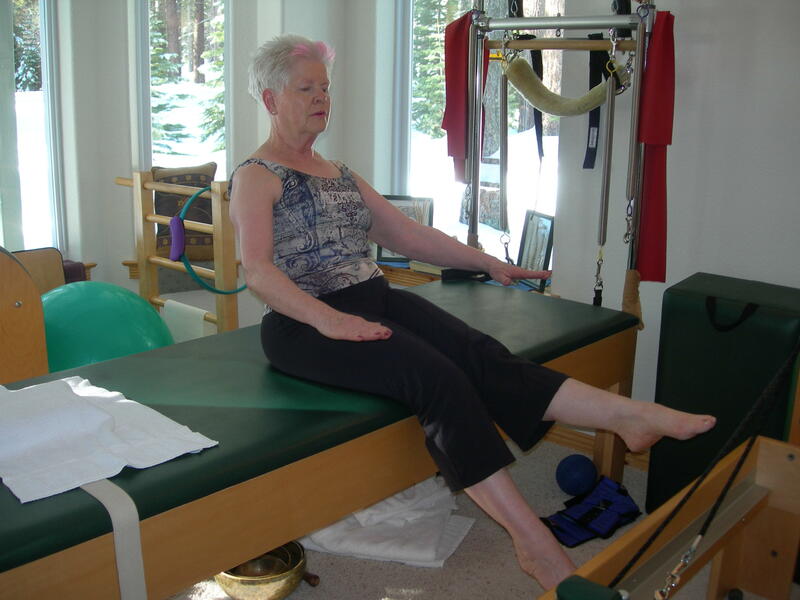 To perform the Pelvic Clock exercise, have your client lie supine with knees bent and feet on the floor (or you can prop the client’s legs on the Reformer Short Box). Imagine that the pelvis is a clock with the navel as 12 o’clock and the pubic bone as 6 o’clock. Move the pelvis into a posterior pelvic tilt (flat back) for 12 o’clock and then return the pelvis anteriorly to 6 o’clock (neutral pelvis) where the pubic bone and anterior superior iliac spine (ASIS) points are parallel with the floor and a lumbar curve is present. Repeat pelvic shifts 4 times or as many times as needed. After returning to neutral pelvic placement, move to 3 o’clock (left lumbar rotation) and 9 o’clock (right lumbar rotation). For example, you could have your client imagine the pelvis as a boat filled with people. Then visualize all the people walking to one side of the boat, so that it dips in the water to one side heavier than the other. Repeat the left and right shifting 4 times. The previous practice moves the client’s pelvis in a cross-like shape relative to the clock (up to down 12 o’clock to 6 o’clock, and left to right, 3 o’clock to 9 o’clock). Next explore the “X” shape on the clock going from 10 o’clock (weighted right waist flat back) to 4 o’clock (weighted reaching left buttock in neutral) and 2 o’clock (weighted left waist flat back) to 8 o’clock (weighted reaching right buttock in neutral). Repeat each sequence 4 times. Finally, have your client use their fingers to palpate each number on the clock starting and 12 o’clock and explore each number individually clockwise and counter-clockwise taking one to two full breath cycles at each number. Once each number has clarity, sew them together like a plate would spin clockwise and counter-clockwise making sure the core initiates the motion, not the feet or legs. The continuous moving clock does not correspond with the breath—the client breathes when needed, not timing it to any number on the clock. Please note that the description of the Pelvic Clock is in the perspective of the viewer of the clock (navel as 12 o’clock). Personally, I would prefer the clock be in the perspective of the person exercising (pubic bone as 12 o’clock), but it is not generally taught this way. So as not to confuse people, I have conformed to standard practices. Be sure that your client integrates breathing into this exercise. I choose to move the pelvis on the exhalation, as it is easier to feel the activation of the pelvic floor and the transversus abdominis to assist with the transition through core initiation. Be aware that there is a tendency for the client to move the pelvis from a distal initiation by pushing on the feet or legs, so cue your client to feel the pelvic floor and engage the transversus abdominis prior to moving. For example, inhale at 6 o’clock and move to 12 o’clock on the exhalation using core muscles. Hold 12 o’clock on the inhalation and then move back to 6 o’clock on the exhalation. You may choose to slow the exercise down spending more time on each number to further activate and deepen the abdominals with a cumulative dropping of the abdominal wall on each breath. Place a tennis ball approximately 4-5” below the posterior superior iliac spine points (PSIS) on the right and left sides of the sacrum in the fleshy part of the buttocks. The target for the tennis balls is either the gluteus maximus or piriformis trigger points. Ask your client to place the balls so they are placed symmetrically right to left and hit these tender trigger points. 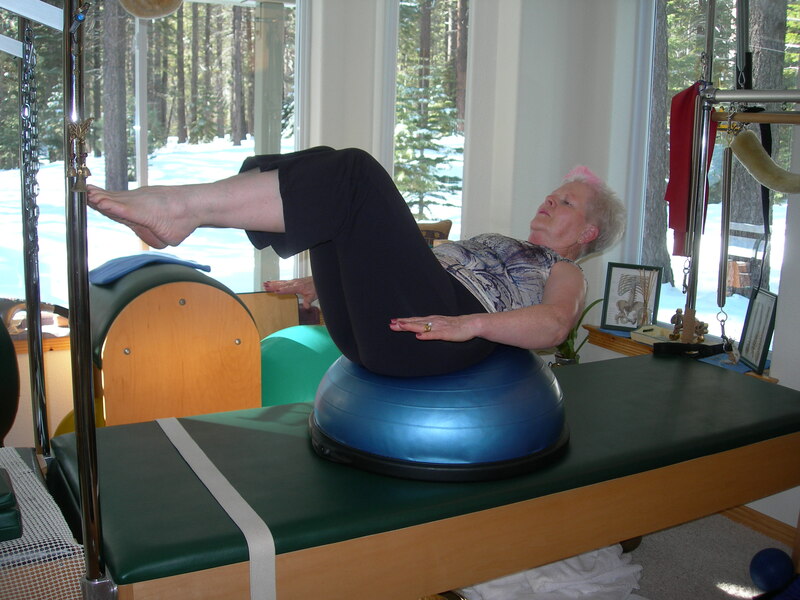 I usually stand up and demonstrate the ball placement visually before lying supine. Although the balls will likely be uncomfortable, discontinue if the discomfort is intolerable. Hitting the right trigger points may require a little fishing, so tell your client that they may move the balls at any time. Since there is more than one trigger point to address, suggest that the balls be moved if the initial trigger point becomes comfortable. Perform the Pelvic Clock as per the instructions above. The objective is to keep the gluteus maximum muscles relaxed as the pelvis is moved to each number on the clock. This will require breathing, concentration and core initiation. Many people tighten the gluts for stabilization, which can lead to tension in the low back and hip flexors. Pelvic Clock with the tennis balls illustrates quickly if the gluts are being used since they dig into the muscles on each movement. This helps the user to let go of the gluts and focus instead on the deeper core muscles of the pelvic floor, transversus abdominis and multifidus muscles. The tennis balls also inform the user when the legs or feet initiate the movement since there is more tension over the balls. 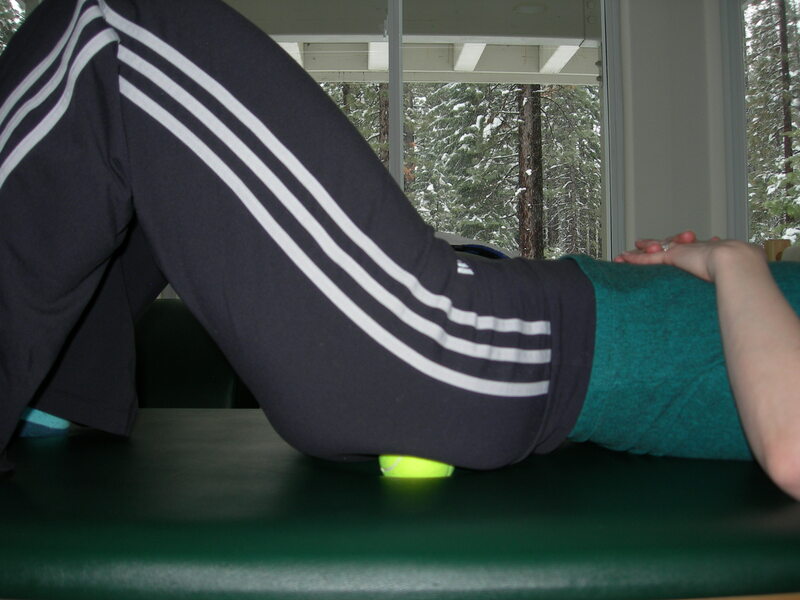 The Pelvic Clock exercise will likely be slowed down when using the tennis balls since it takes time to relax the tension in the piriformis and gluteal muscles. Have your client imagine the buttocks are like honey melting over the tennis balls. The focus is on the journey from clock number to number feeling the tennis balls almost being absorbed into the gluts. For example, if an ant were walking across the ball, it would take a lot of steps and every bit of the ball surface would be noticed. That should be the feeling experienced when using the tennis balls with Pelvic Clock. Point out to your student that the abdominal muscles play a bigger role in a posterior pelvic tilt (12 o’clock) and the lumbar extensors initiate the movement back toward neutral (6 o’clock). Many people have never isolated and observed these muscles in action. 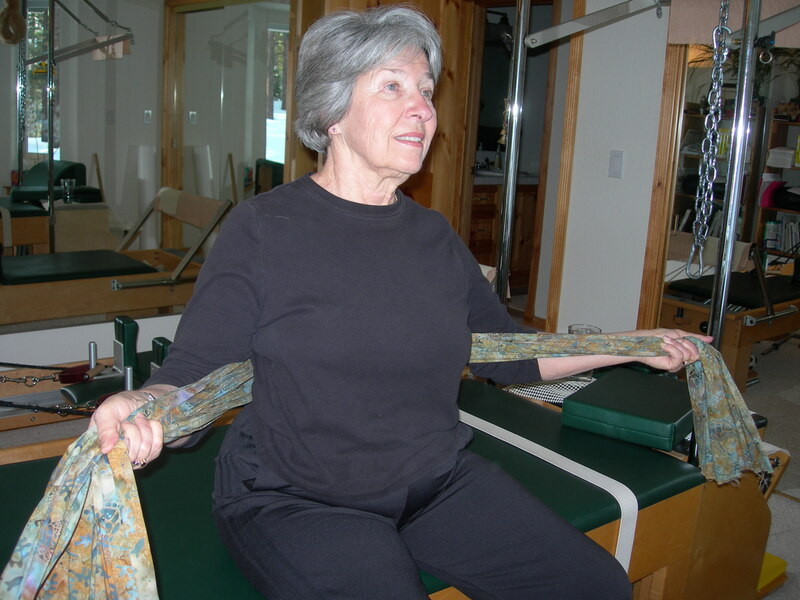 Also cue your client to be aware that the low back should feel a stretch when shifting to 12 o’clock where the tailbone feels as if it is reaching toward the back of the calves. 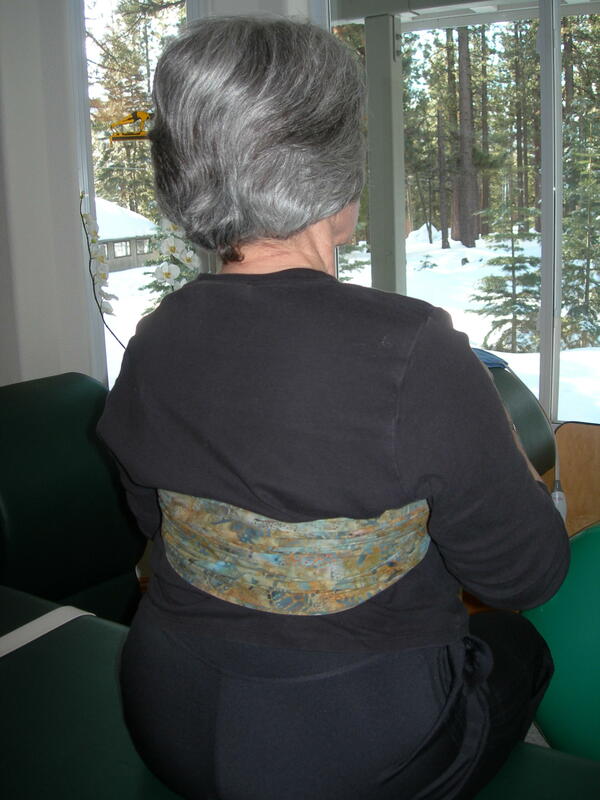 Often people will just push the low back toward the floor with tension and miss out on the experience of the simultaneous contraction in the front waist and lengthening of the back. 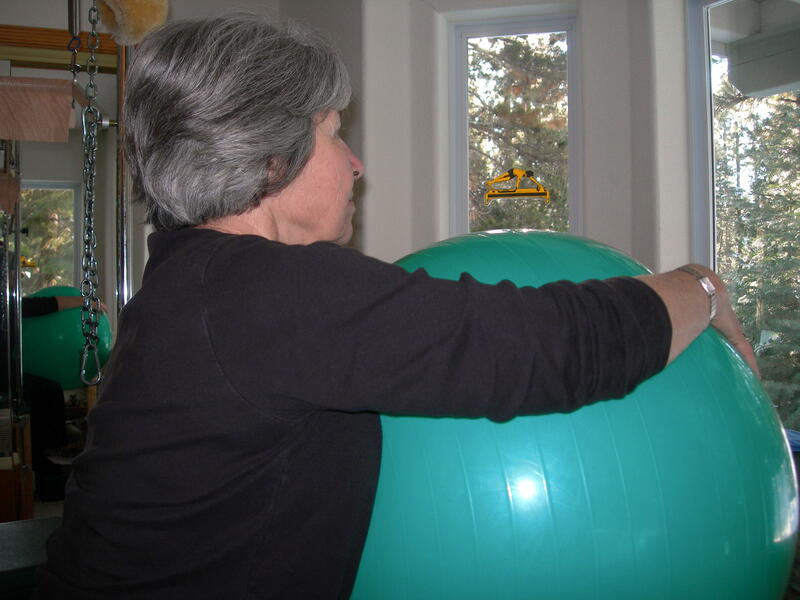 For a group Pilates mat class, the tennis balls are an inexpensive teaching tool that can multi-task. 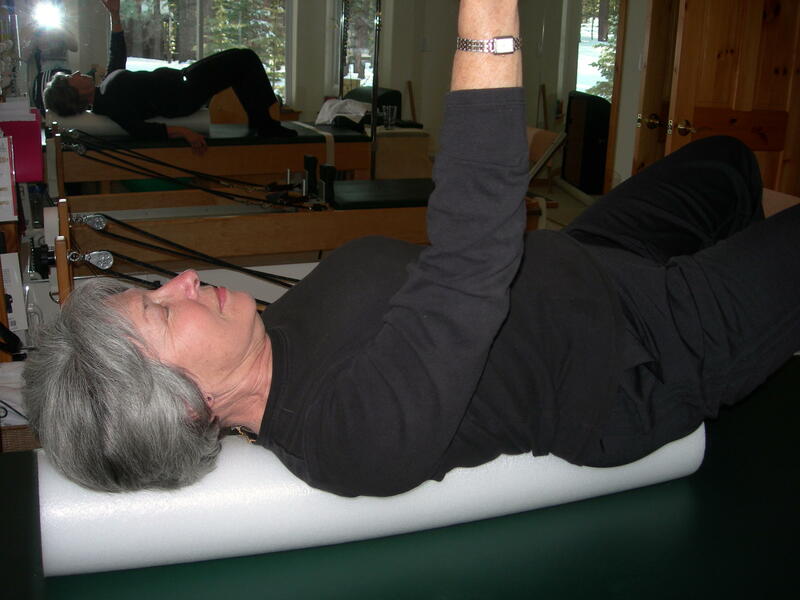 They release the myofascial trigger points that can often interfere with proper core initiation, and provide improved proprioceptive awareness to the user. Always give the option to students to do the Pelvic Clock exercise without the tennis balls, but my feedback from students has been that the addition of the tennis balls is beneficial. 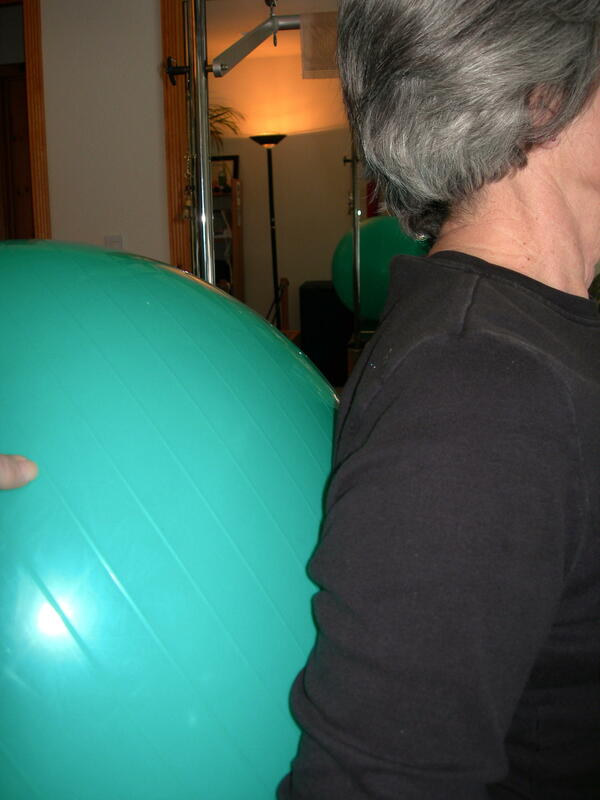 After doing the Pelvic Clock exercise with the tennis balls, remove the balls and your students will be amazed at how comfortable and easy it is to feel neutral pelvis placement. Once you have taught your students the Pelvic Clock, you can reference the clock numbers for instruction in the Pilates matwork. 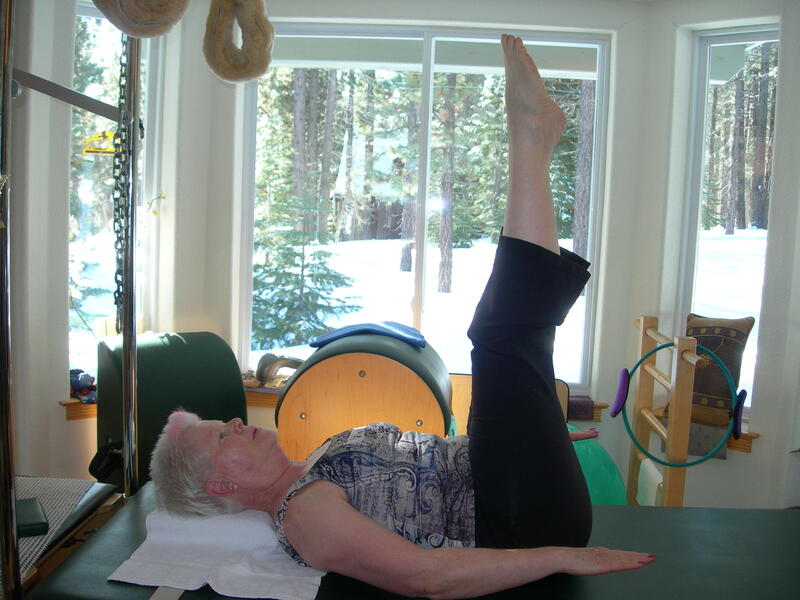 For example, during a right Single Leg Circle, you can instruct your students to focus on 3 o’clock to stabilize the pelvis and counterbalance the weight of the right leg. In Double Leg Stretch you might suggest that the students keep a lengthened 12 o’clock imprint. The Pelvic Clock exercise is an effective tool for teaching your students pelvic placement, core initiation and integrating breath with movement. The use of tennis balls takes the exercise to another level adding myofascial release of gluteal muscles and improved proprioceptive awareness of the pelvic region. Many people are unaware on the tension in the superficial gluteus maximus when deeper core muscles are engaged to shift the pelvis placement. The tennis balls alert the user to unwanted gluteal tension prompting relaxation and proper deep core activation of the pelvic floor and transversus abdominis. Once the gluteal tension is released, the subtle shifts in pelvic motions can be observed and the deeper core muscles identified. Tennis anyone?